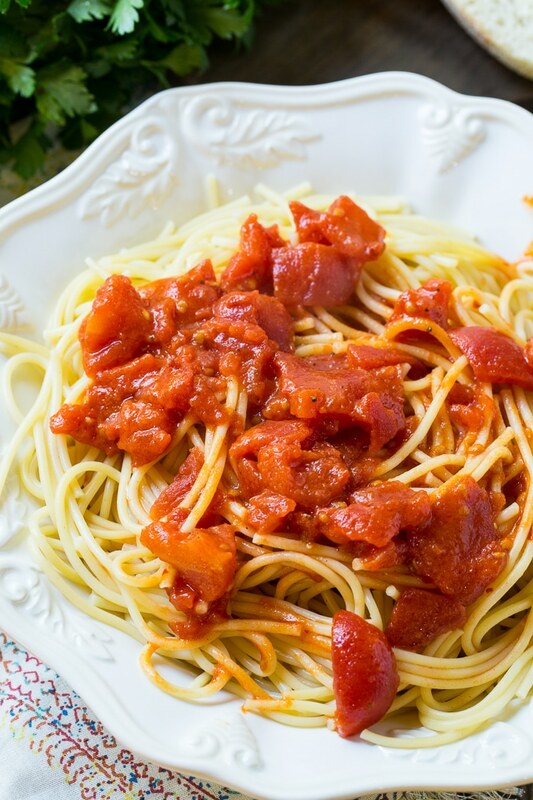 Spicy Tomato Butter Sauce is a simple but delicious pasta sauce that only takes minutes to prepare. The butter gives the sauce a velvety texture and red pepper flakes make it a little spicy. Makes a light summer meal when served over pasta. Since there are only a few ingredients in this recipe, you really need to use high quality ingredients. You want the best tomato flavor you can get and if you’ve ever done a taste test off different canned tomato brands, you know the quality and taste really varies from brand to brand. In my opinion, Tuttorosso Tomatoes are hands down the best tasting canned tomato on the market. I like to have my pantry stocked with their peeled plum tomatoes at all times. They are perfectly ripe with nothing but fresh tomato flavor. 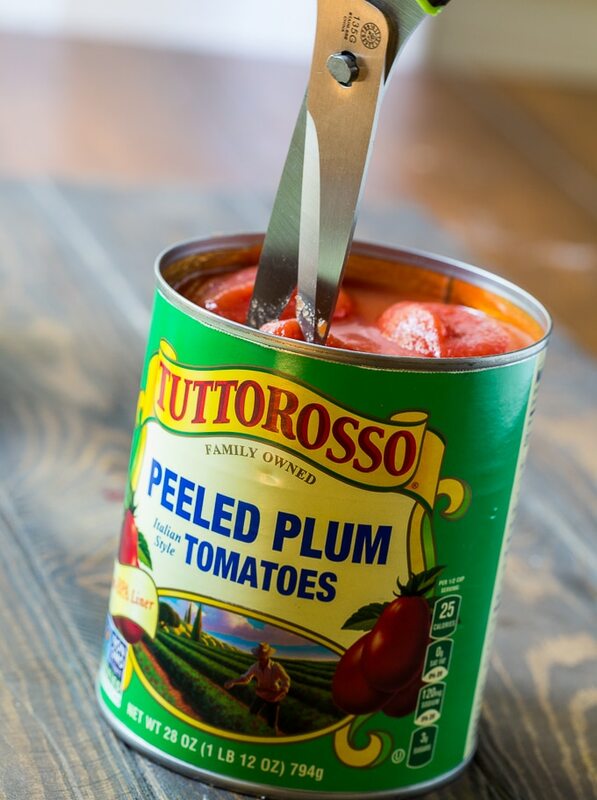 Tuttorosso is a family-owned company that has been growing tomatoes for over 70 years. They can only vine-ripened, Non-GMO tomatoes picked at the peak of ripeness and use non-BPA lined cans. Buy canned whole tomatoes. They are the best tasting tomatoes available. Then if you need chopped or diced tomatoes for a recipe, get out your kitchen shears and cut them right in the can. You have no mess or clean-up like you do if you use a cutting board and knife and the juices and seeds run everywhere. And you save room in your pantry by buying only 1 type of canned tomatoes. 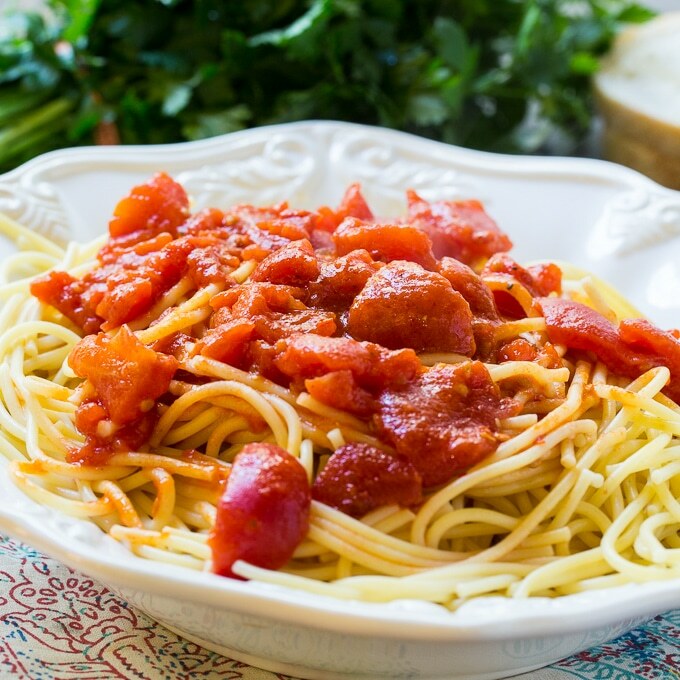 In less than 20 minutes and with hardly and kitchen clean-up, you can have a fresh and tasty pasta sauce with a little kick. Melt butter in a medium saucepan. Add garlic and cook 1 minute. Use scissors or a knife to chop the tomatoes while they are in the can. Add to saucepan. Add sugar, red pepper flakes, and salt and pepper to taste. 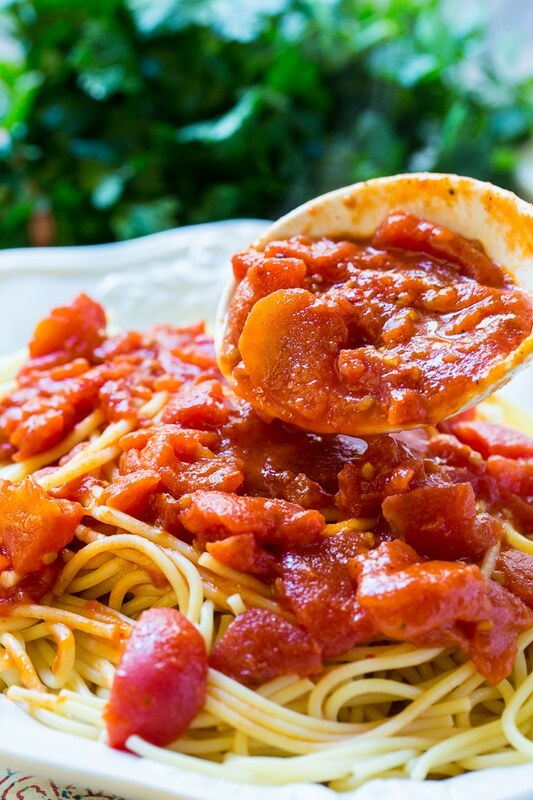 This entry was posted in Main Dishes and tagged pasta, tomatoes. Bookmark the permalink. I love the sound of this sauce, Christin! I’ve never had a tomato sauce quite like this before. Sounds so flavorful and I love how easy it is!